Claim: Evolution is a lie. It’s just a secular religion. Fact: Evolution is simply what several separate and unrelated lines of evidence converge upon. 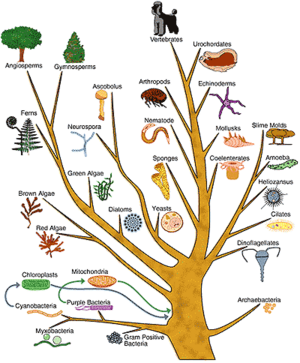 The fossil record, DNA similarities, geographic patterns, embryonic similarities, homologous structures, vestigial structures, phylogenetic similarities, various methods of dating (carbon, tree ring, radiometric, coral,etc) and other factors all independently point to evolution. Anti-evolution arguments are a collection of logical fallacies, most often straw man arguments that don’t take the actual available evidence into account. Since Origin of Species was published, the theory of evolution has been the source of much controversy, especially in religious circles. To this day, a cottage industry that purports to “debunk” evolution exists in the form of books, lectures, videos, and even creation museums. Often referred to as “creationism” or “creation science,” this industry doesn’t provide actual science but rather feeds its readers, listeners and viewers, a straw man version of evolution. Acceptance of evolution is essential for the advancement of medicine, agriculture, phenomena that are biological in nature, and other areas of science, such as geoscience (Dobzhansky 1973; Fail 2008; Gould 2002; Mayr 1982)…Low levels of evolution understanding and acceptance may have a negative effect on scientific developments and support for science by society (Miller et al. 2006). Evolution is a theory and a fact. This seems contradictory to many people, because in everyday vernacular, the word “theory” is often used in place of words like “hunch” or “inclination.” But in science, the word represents an idea of set of ideas that explains facts or events. Evolution is the only theory which can explain the diversity of life and how it came to be. It explains why fossils are arranged in the strata in the very order that they are, and how this correlates to modern fauna—even in terms of geography (for example, the evolution of modern apes is found in Africa, the only continent where apes exist). Evolution explains why organisms have such DNA and anatomical similarities. Therefore it is a “theory” because it explains these facts, which independently support evolution. What’s more, is that these factors have the capacity to dispel evolution. If apes were somehow genetically more distinct from humans than say, mice; if we suddenly found a species of 6-legged mammals; if we found a rabbit in the Cambrian layers, this would be a blow to evolution. The above facts (along with many others) not only point to evolution, but they also disprove alleged competing claims (whose foundations are actually religious, and simply use a series of arguments as a sort of “science in disguise”). It’s also important to keep in mind that evolution is independently supported by the various earth sciences (Biology, Geology, Geography, Paleontology, Anthropology, etc). 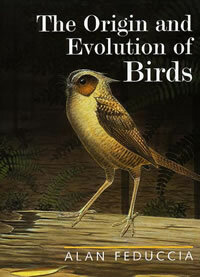 -Explains the transition from feathered dinosaurs to modern day birds. Also addresses most creationist arguments. -A debate an evolution blogger had with creation scientist Dr. Jackson. Contains the converging lines of evidence for evolution, common creationist rebuttals to them, and responses to those rebuttals. -Explores the correlation between the arrival of humans into the Americas and extinction of mammoths and other megafauna in the Americas. Anti-evolution arguments are hardly a problem for evolution. If you feel differently, feel free to spend some time on these websites, as they are full of evolution facts. Talk Origins – an impressive archive of responses to creationist claims, evidence for evolution, and the exposure of creationist hackery. Talk Origins – Index to Creationist Claims – responses to most anti-evolution arguments and provides evolution facts. Talk Origins Quote-mine project – Creationsists are fond of quoting scientists out of context. This site shows the contexts. Learn what Evolution actually IS (not what you’ve been told if your evolution knowledge comes from anti-evolutionist sources). At least read these so you understand why questions like “if evolution is true, then why are there still monkeys?” are silly at best. PBS Evolution Library – an EXCELLENT FAQ! Evolution is not a linear event nor is it a ladder. It does not mean upgrade and evolution does not “lead up to humans.” Humans are simply a variation of the plethora of life that evolution has resulted in. Much of the creationist propaganda presupposes that humans are the end sum of existence and therefore we can’t possibly be animals. “I find a nebula beautiful therefore it was designed” and “how can you possibly think we are animals” only shows the egocentric nature of creationist thought. 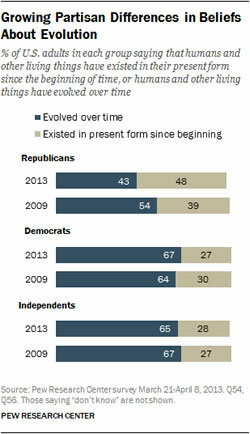 To oversimplify, Evolution is the gradual change in species over time. Evolution explain how life as we know it came to be, and this was accomplished via genetic changes (the successive change in alleles) that occur each reproductive cycle (we know this happens, because none of us are identical to our parents nor our siblings. We can observe evolution in real time when we see speciation in effect, not to mention what we’ve learned through the study of DNA). In nature, where species must compete with each other for food and mating rights, only so many of them will be successful. In a given environment, species with certain traits will have certain advantages over others and therefore have much higher likelihood to survive and reproduce, thereby passing on the genetic traits that made them successful, while those without these traits will be less likely to survive and reproduce and therefore those traits that proved to be disadvantageous will be less likely to continually exist in a species. Read more about the various causes of evolution. Sometimes species will spread out become isolated from each other, and the same species will exist in completely different environments. Sometimes the local ecology will change. This will result in a different set of traits to be naturally selected (in real time, these small changes are known as micro evolution) and over millions of years, will result in gradual large-scale changes (macro evolution). So then, why do creationists claim that “evolution says everything is getting better” or “things are not evolving they are devolving?” Simply put, these are straw man arguments (building up a weak version of an opponent’s viewpoint and attacking it). Likewise with their attack on the phrase “survival of the fittest.” This is not how evolutionary scientists generally describe evolution, and the term was actually coined not by Charles Darwin, but by Herbert Spencer who was writing about his ideas of economics and likening them to Darwin’s Natural Selection. “Fittest” in this manner is a misnomer because what’s considered ‘fit’ in one environment may prove to be a serious disadvantage in another. Creation Science as Pseudo Science – Rather than explaining why each Creation science arguments are pseudo science I will provide links to rebuttals for some of the more common garden variety arguments that Creationists seem bent on repeating. In other words, Creationism’s only real purpose is to distort evolution facts due to perceived conflicts with their religious beliefs. Real science gathers and investigates facts, produces hypotheses and theories which it continually tests with falsifiable means. This methodology has led to the theory of evolution, which is universally accepted as a fact in the science community (minus a few religious scientists who can easily gain a large following in a nation with a religious majority). Creation science does not follow such an objective methodology. Rather, it collects whatever convenient information it can find in order argue for the belief in creation while using straw man arguments, quote mines, and in some case, outright lies to discredit evolution. Few creationists understand this because they in fact see it as a debate; one side says this, the other side says that. They generally fail to see that the ‘evolution side’ is virtually the entire science community, and that Creationist rebuttals are little more than semantic distortion of evolution facts. Entrusting your understanding of evolution to Creationist sources is like entrusting your understanding of smoking’s effects on your health to Tobacco Industry scientists. Many people do not realize that the word theory has a different application in science than it does in every day usage, where we use it interchangeably with words like ‘hunch’ or ‘conjecture.’ This is simply not the way the word theory is used in science, where the word theory and fact are not mutually exclusive. Below are snippets of and links to articles that further illustrate this fact. If you are going to insist on simply accepting what creation science has to say about Evolution, at least read the ‘other side’ of the story from sources like TalkOrigins, then do some of your own independent research and decide what to believe. Sadly, few literalist Christians will do this because generally speaking, their idea of research is limited to looking for more reasons to continue believing what they are already desperately trying to continue believing. 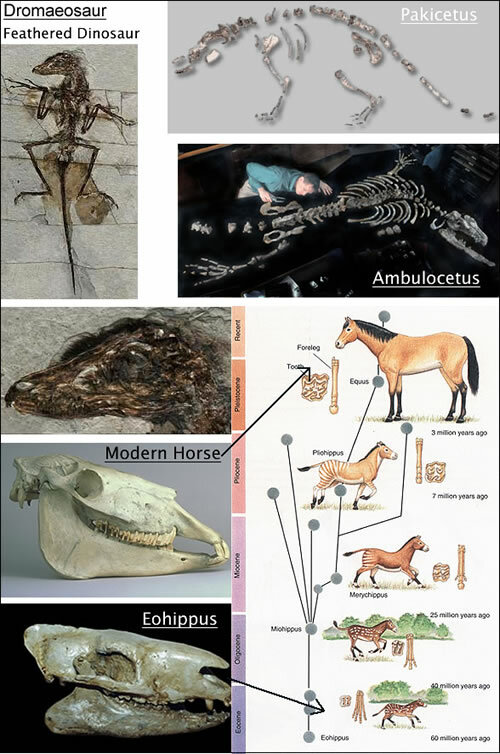 If Evolution is true, we should of course, find at least some intermediates between older and newer fauna (fossilization is rare so there is no point in expecting to find every ‘step’ between them). 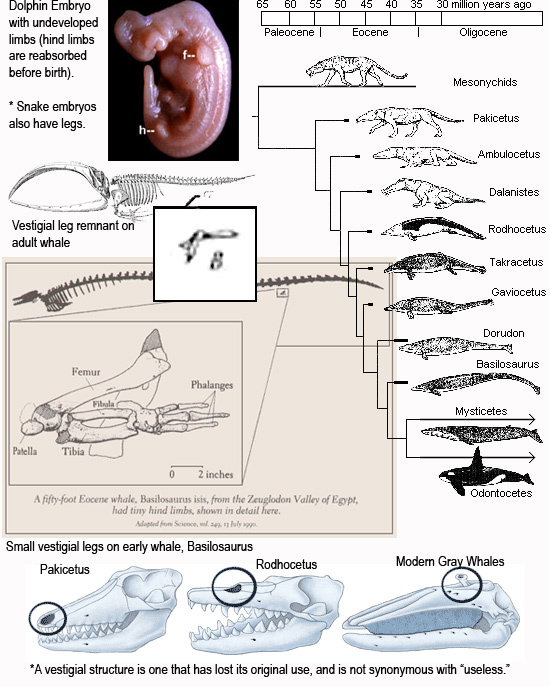 If birds evolved from reptiles, we should find reptile-birds, and if whales evolved from land mammals, we should find semi-aquatic mammals as well as whales with leg remnants. Furthermore, we should find these transitions in the layers connecting the appearance of these creatures. Because Darwin predicted we would find such transitional forms in the fossil record, and because the Bible (Genesis 1:21) claims that God created each animals according a specific “kind,” Creationists are weary of admitting that these transitional fossils exist, and have devised a number arguments to negate these findings. Superficially, some of these arguments are sound, especially to creationists who refuse to read ‘evolutionist’ material and obtain all of their information on evolution from creationist sources. Note, if you are confused as to the use of the word “kind,” It is no clear hat Creationists have ever come up with a consistent definition. It appears to lie somewhere in between “Class” and “Family,”moving back and forth within this range, depending on what it is creationists are asserting or denying at the moment. In 1860, a bird with reptilian qualities was discovered in Jurassic deposits (the layer we’d expect to connect dinosaurs and birds). Known as Archaeopteryx, this bird has become the classic example of a the transitions Darwin expected to be found. Nearly 150 years later, Creationists continue to claim that “Archaeopteryx is just a bird” and then start listing its birdlike qualities while completely leaving out the numerous reptilian features that no modern birds possess (long bony tail, teeth, pneumatic bones, free vertebrae, reptilian mouth as opposed to a bill/beak, etc). The fact that it’s classified as a bird (it is) comes from a blatant misunderstanding of taxonomy. 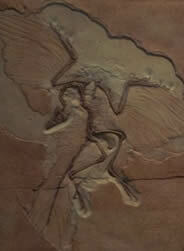 Archaeopteryx has to be classified in one group or another. If it were classified as a dinosaur, Creationists would use the same argument, only substituting the word ‘dinosaur’ for ‘bird.’ Dinosaurs and birds are so closely related that they are often regarded as the same (birds are sometimes regarded as avian dinosaurs, while other dinosaurs are considered non-avian dinosaurs, and birds are in essence, a type of reptile). In this sense, it is almost pointless to say that dinosaurs are extinct, given that we may regard birds as modern dinosaurs. This is no different than with what see with fish. There are numerous Devonian era fish that are now extinct. Even though THOSE fish are extinct, modern day fish are simply their modern day relatives. So it would make no sense to say that fish are extinct, even though modern fish are not identical to Devonian era fish. There is also the straw man arguments that ignore the very basic understanding of evolution as sort of a tree and make it out to be this linear event, whereby one species cannot lead to another without going extinct. The Institute for Creation Research is very well known for using arguments like these, which work like this; Evolutionists claim that Species Y evolved from Species X, yet they are often found in the same strata of the fossil record. This argument implies that EVERY member of Species X must evolve into Species Y if evolution is true. This is a blatant and, I have to assume, intentional skewing of speciation. Species give rise to other species for various reasons, including changing ecological conditions or isolation. There is nothing about speciation that would lead one to believe that Species Y and Species X can’t possibly be contemporaries. This is simply one of the many straw man arguments in the Creationist arsenal. Then of course there is the faulty claim that Archaeopteryx is a fraud. This is one of the urban legends that Answers in Genesis advises Creationists not to use. There is also the “fall back” argument that there should be transitions in between Archaeopteryx and other reptiles of birds. Like virtually all other Creationist arguments, this is based on an assumption, and it completely ignores the study oftaphonomy and what it says about the rarity of and requirements for fossil preservation. Creationists claim that there are no living intermediates AND use living living intermediates to support their argument that transitional fossils don’t exist. The Hoatzin is a perfect example of this. Creationists often claim that the claws on Archeaopteryx hardly make it a dinosaur, considering the fact that the Hoatzin, a modern bird, has claws. Among ‘Land-Whales’ we have some impressive creatures like Ambulocetus, Basilosaurus, Pakicetus inachus, and others. The amount of transitions we find are enormous and constantly growing. I suggest visiting TalkOrigin’s list of Transitional Fossils and doing further research on the transitions of your choosing. 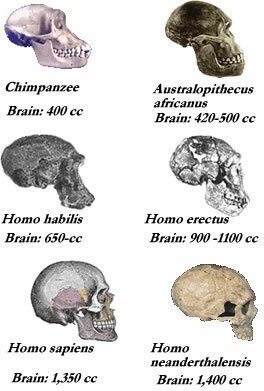 A prime example of a Transitional fossil would have to be our extinct cousins and ancestors, the Hominids. 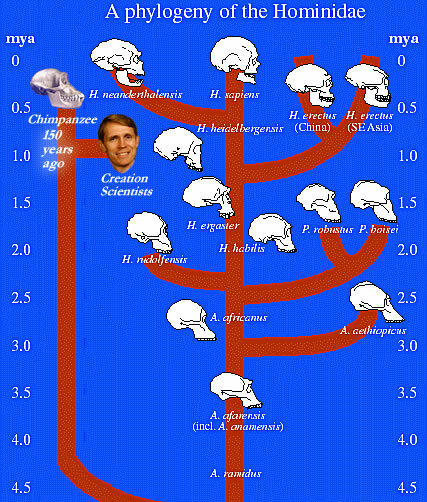 Most creationists seem to blow off the entire hominid line and bring up Nebraska Man and Piltdown Man, along with urban legends of Lucy’s (Australopithecus Afarensis–and they appear to think that “Lucy” is the only afarensis ever found) skull or knee cap being found far away from the rest of her body. They appear to ignore the rest of the Hominid line most of the time. Creationists generally have no idea just how extensive these findings were. 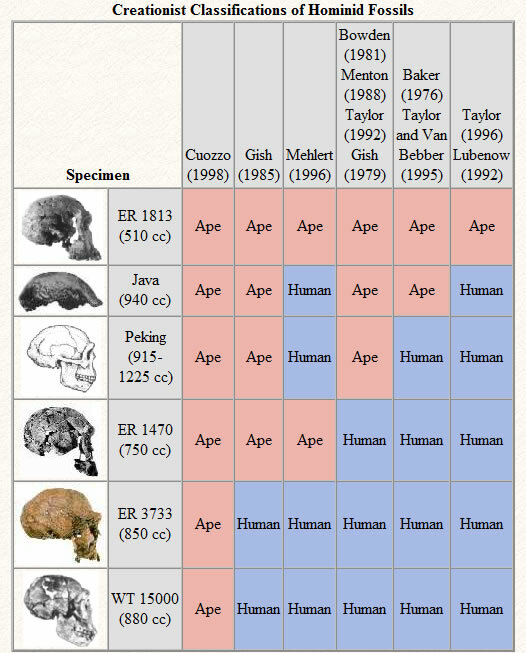 We see a clear gradation from ‘ape to human’ in the study of Hominid anatomy. Apes have large defined sagittal crests and jaws, small brains, and a spine and pelvis that clearly make them knuckle-walkers. Humans have smaller jaws, much larger brains, and a pelvis and spine that’s useful for walking. Within the various hominids, we clearly see several levels of transitions, not only in their anatomy, but in their abilities to use stone tools, fire, even rudimentary forms of art and we make our way to the anatomically modern homo sapiens. 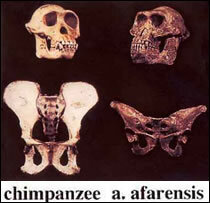 Hominid fossils are not limited to ‘a few monkey skulls’ as Creationists would have you believe. Numerous species have been identified. I suggest watching these 2 documentaries for a basic understanding of the Hominid line. 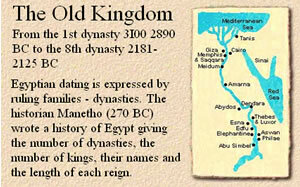 Then read the following links for more details on the various Hominids. Ape to Human – History Channel Documentary explaining the various Hominid findings! Becoming Human – Excellent interactive Documentary about the various Hominids! Creation Scientist Confusion on Hominids – Creation ‘scientists’ are adamant that Hominids are not ‘ape-men,’ but they can’t agree in which are ape and which are human! The line from ‘bipedal ape’ to modern human is so blurry that creation scientists disagree which of the hominids are ape, and which are human. The Law of superposition explains how lower strata tend to be older than the strata above them. The existence of successive rock layers is caused by the deposition that takes place over the different Geological eras. Erosion takes away from these sediment layers. So while the order of successive layers are consistent, the layers for each Geological era do not exist in uniform sediment thickness, because deposition and erosion do not happen uniformly throughout the world, nor at the same time. Hence, the Creationist argument that the column must be more ‘universally’ present in order to be valid is simply untrue and ignores basic Geology. Simple physics (ie. gravity) and common sense makes it apparent that the lower strata are older as they have to be formed in order for more sediment to be deposited above them. There are a few exceptions to this of course; thrust faults and folds for examples can cause contortions in the layers. The existence of folds and thrust fault have are well understood and can be checked for, and they are by and far the exception to the rule. Things like trees cutting through stratigraphic layers’ can easily be explained by simple Geology 101 concepts like cross-cutting (the cutting of older, but still-soft sediments by newer, objects). The above statements are by no means ad hoc explanations. These Geophysics principles were known before Darwin’s voyage on the Beagle, and were therefore not created for the sake of arguing evolution. Rather Evolution is in fact, largely born of the Geological history and the order of the fauna within. The men who founded modern Geology were in fact Christian, which is why Old Earth Creationism (known today as Progressive Creationism, and is sometimes mixed and matched with Theistic Evolution) predates the theory of Evolution. The geologic column and the law of faunal succession show us that the Earth’s fauna have appeared in a certain order, and Evolution simply explains the cause of this reality.The fact that Christian scientists were already modifying their view of Creation to accommodate this fact should serve as a wake up call to creationists. To oversimplify what we find in these successive layers; we find fish before we find amphibians, which we find before we find reptiles, which we find before we find birds. A similar succession of fauna can be applied to the faunal succession leading to humans and whales. Furthermore, we find representations of transitional fossils (“in betweens”) in the layers we’d expect them to if certain orders of animals evolved from others. 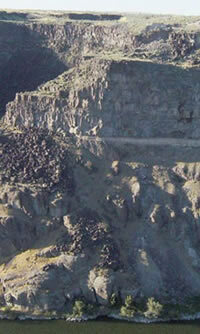 Understanding of the Geologic/Stratigraphic Column is also used in commercial enterprises like Petroleum Geology. I would venture to say that in modern western society, one of the biggest ‘validators’ of a scientific theory is when we see it successfully used commercially–especially in the petroleum industry. 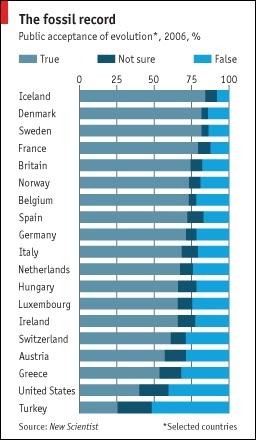 Successful corporations do not throw money away on 2nd rate science. Creationists are essentially stuck with having to call 200 years of Geology a big mistake or even a lie. Arguments about human artifacts and/or footprints being found alongside dinosaur tracks or inside fossilized coal always turn out to be urban legends. 1-Basic ignorance of sedimentation: This generally involves the belief that deposition is measured in mere ‘height’ of layers (as opposed to the time it takes to harden into different types of rock). In other words, if 10 feet of soft sediment can be rapidly deposited, than then existence of 10 feet of sandstone or granite can very well have been deposited yesterday. 2-Ad Hoc explanations: Some creationists will use everything from hydrodynamic sorting to “pre-flood habits” to try and explain the order in which we find these fossils, and argue that this is consistent with a global flood depositing the layers we find. The more you know about this order however, the more blatantly false these explanations become. Animals of similar niches (like large elephants and sauropods, crocodiles and semi-aquatic mammals, fish and whales) show up in completely different layers of the strata. Not one whale is found with the ancient Devonian fish, and semi-aquatic mammals like Ambulocetus (in many ways a “a mammalian crocodile”) and Basilosaurus (an early whales with small remnant legs), show up in succession, and well before modern whales. This Correlated History of the Earth poster provides an a more in depth look at this order or animals, plants, tracks, etc found throughout the Geological layers. http://jan.ucc.nau.edu/~rcb7/verde.html (includes pictures of the column). 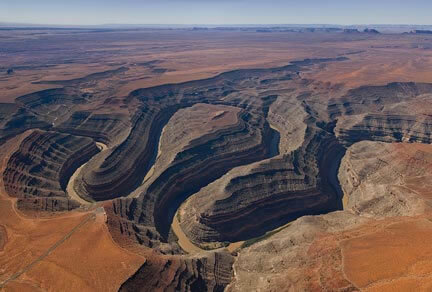 Creationists want you to believe that the biblical flood created meandering canyons like this, meaning that a body of water both cut through so much sediment in such a vertical manner AND did so in this meandering fashion. Homologous structures are displayed throughout the animal kingdom. Not only do we see this among the world’s existing fauna, we see its development in the geological record as we see more and more modern animals branching off of the lower orders. This makes perfect sense in light of Darwinian evolution, which is limited to modifying structures that are already in place. On the other hand, a creator isn’t limited to following the same basic tetrapod pattern over and over. Hence, homologous structures is what Evolutionary theory would predict, whereas the “common creator/designer” argument represents nothing more than an ad hoc explanation for Creationists. He later retracted the statement when confronted with a visual of how the blow hole is not “behind the brain.” Sadly, this is a common misconception even among creationists with some scientific background. They pass this information off to less knowledgeable creationists who think they’re learning science. Certain Isotopes have stable decay rates, each of which can be used to date the strata they are found in. The different decay rates would not match up when dating both 50 MYO and 500MYO rocks if these decay rates were not stable. Geochronologists test and cross-test these results over and over. Creationists sources try and argue that the historical stability of isotopes is only assumed. The problem with this argument is that it avoids the fact that the “assumption” is proven by the constant cross-referencing of isotopes of different decay rates, as well as other dating methods (ie. tree ring and carbon dating). Furthermore, the effect of so many isotopes decaying at a rate fast enough to have decayed to such a rate within 6,000 years (the Young Earth Creationist Time Scale), the build up of heat would make life on Earth impossible. Not all isotopes can be dated. This can date most once living things (assuming they weren’t exposed to factors that affected it’s carbon levels, like petroleum) that lived between 150YA to 50,000YA. Anything that’s lived within the last 150 years is subject to the levels of carbon produced by the Industrial Revolution and Nuclear Testing. Also, anything that’s touched Petroleum (like Hovind’s infamous snail example) will also have an affected carbon rate. Things that can be cross-checked historically always check out just fine; the dead sea scrolls and mummified people and bulls for example. There is no reason to doubt the validity of Carbon Dating. The ‘examples’ creation ‘scientists’ love to use are generally samples that can’t be reasonable dated for one of the above reasons. In fact, once you read about and understand radiometric isotope dating, then read creationist arguments, it becomes clear that many if not most creationists confuse the two and don’t understand the difference (that’s a polite way of saying “they don’t know what they’re talking about”). Perhaps the biggest Young Earth Creationism blunder lies in is the fact that written communication has existed for some 5,000 yearsnow and Archaeologists have developed an overall chronology of earlier civilizations. Egyptologists can trace Egyptian history as far back as 7,000 years ago, which is not only further back than Adam and Eve, but incompatible with the idea of civilization being wiped out by a flood 4,500 years ago. Because human settlements tend to lie in coastal areas, these early civilizations no doubt experienced floods, which to them, may have appeared to encompass the entire world. While Creationists tend to view the multiple flood stories as evidence for the Biblical flood, they appear to automatically discount the possibility that Genesis story is actually borrowed from older flood stories. Furthermore I have always found it culturally ethnocentric that the multiple instances of these flood stories must somehow exist as evidence for Noah’s flood, while the characters in the ancient Sumerian and Greek floods are no doubt fictional. Not to be outdone by the comparatively intellectually honest creationists who have evolved into Intelligent Designists (which more or less makes them Theistic Evolutionists depending where they individually draw the line), the stubborn Creationists are simply denying the validity of certain fossils by claiming we’ve only found a fraction of what’s actually been recovered. This seems especially true in whale evolution. They want you to believe that Pakicetus is represented by nothing more than a partial skull and Ambulocetus is fragmentary.